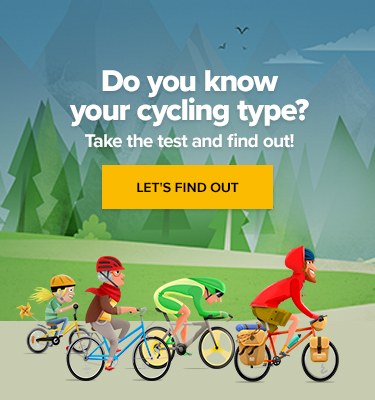 There is no sufficient excuse for driving too close to vulnerable road users, which also includes people riding motorbikes and horses, but mostly concerns people on bicycles. As motorists are safely encased in a vehicle that can allegedly protect them against hitting a brick wall at 50 km/h, they tend to relax behind the wheel, speed, and stop paying attention to their environment. Or they are simply unaware of the distance cyclists need to feel and be safe, as we had shown in the fitting infographic below. But where driver’s safety begins, cyclist’s ends. 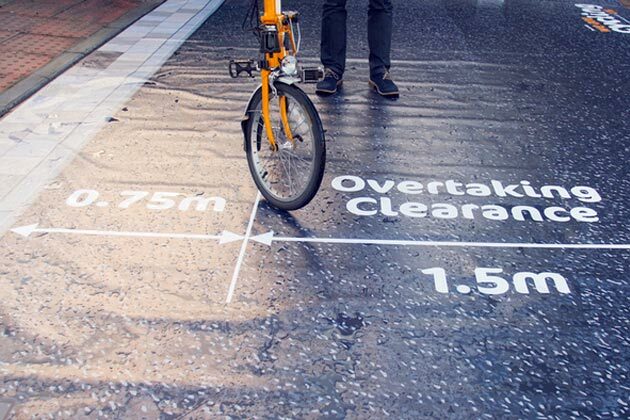 Inspired by the UK West Midlands Police Traffic Unit’s “Operation Close Pass”, Cycling UK created a Kickstarter campaign that will equip every police force in the UK with a safe pass mat that is supposed to be laid on the ground and instruct drivers on the safe distance they should adhere to when overtaking a person on a bike. The West Midlands police created a prototype mat of their own a year ago, pictured below. The Operation Close Pass was almost an overnight success and had an immediate impact. Within a week of the police stopping the offenders and demonstrating them what they did wrong and sending the repeated offenders off with a fine, things were already getting better. Cyclists were reporting a huge overall improvement of the situation and dangerous driver behaviour seemed to be rare rather than commonplace. And the mat played its major part in this happy change of events. That’s why Cycling UK decided to help the UK police forces out, when their funding is being constantly cut. They’ve created their own version of the mat to distribute among officers because the idea has been very well received. “We’ve already been speaking with police forces across the UK to gauge the attraction of having a close pass mat, and have the support of the officers behind West Midlands Police original initiative,” says UK Cycling’s statement. According to the campaigners, close passes account for around 1/3 of life-threatening incidents when biking on the road, and there’s no reason why should police not prosecute this life endangering behaviour. “Every single police force in England, Wales, Scotland and Northern Ireland needs a safe pass mat like this. By bulk buying, we can cut costs and help police keep our roads safe,” says UK Cycling spokesperson. They are raising £12,000 for manufacturing and even distributing the mats to all parties interested. We are keeping our fingers crossed!